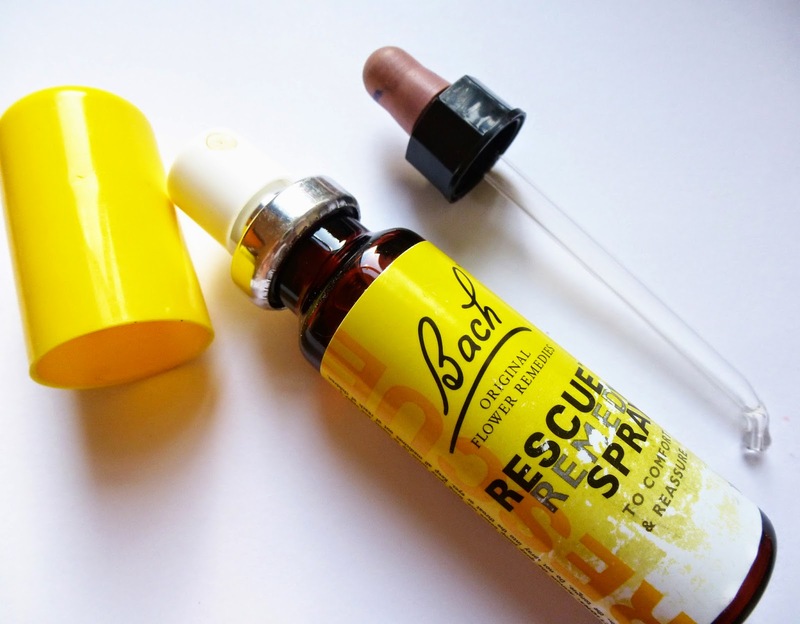 Anyway, today’s post features the Bach, ‘Original Flower Remedies’ Rescue Remedy. I have both the spray and the dropper, but there are other products in this range including little yummy pastilles and chewing gum. I had never heard of this product before, until my friend who always swore by having a pastille before taking an exam. I thought I would write this post and share this product with you all, in case you had never heard of it before! People that read my blog, twitter, or people who I have talked to a little bit more, may know I am a little bit of a ‘worrier’. So I looked into this range and ended up purchasing the spray for myself, purely for convenience. My auntie later gave me the dropper one, since she loves using it too. 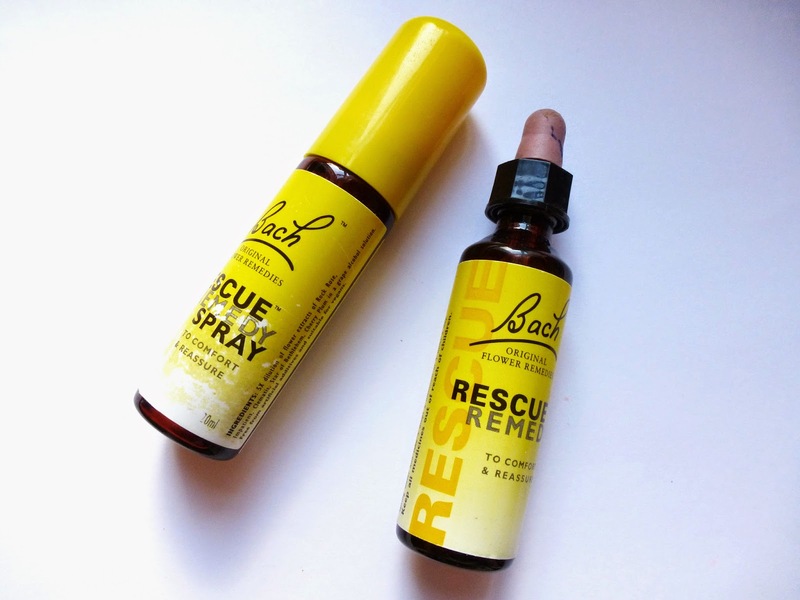 On the bottle is says “Rescue Remedy provides support at times of emotional demand, such as before a driving test, or interview, exam or flight, or when you simply need a little help” Who wouldn’t want to use this? With the spray you just use 2 sprays on your tongue, and the dropper you either have 4 drops on your tongue or pop 4 drops in a bottle of water. I quite like doing this because it also makes me drink more water! Which I think everyone wishes to do! So, I guess you would like to know if this works?.. I admit I haven’t used it in an awful while because I started to get worried that you could overdose on it or something because I was using it an awful lot… which I guess makes it pointless if you are trying to stop worrying! BUT other than that, I think it does really help, or at least your mind convinces yourself it works, acting like a placebo I guess. I have also spoken to people who also use this, and they say it helps because often it provides a distraction and something else to focus on, which helps them and I guess can only be a good thing! I would fully recommend anyone that suffers from perhaps, OCD, anxiety or panic attacks to give this little bottle of magic a go. Even if you don’t suffer from these, you can definitely still use it! Because after all, everyone worries about certain things in life sometime, it is definitely normal! This little bottle helps to comfort, and balance these worries whilst de-stressing and restoring your happiness. It may not work for everyone, but for about £7 it is worth giving it a go! Next Post SHOPPING | Your Phones Best Friend! Wow I'd never heard of this before! I always use calms, but a spray sounds more convenient to be honest! I'll have to try it out 🙂 and its vegan! Always wondered about this as I have seen it in boots before, but like you said I worried about the possibility of overdosing and even becoming too reliant on it! May have to give it a go though, I suppose it doesn't hurt to try and if it works then I will be very happy. My driving instructor gave me some of this before my test and like you say, it's magic stuff! My butterflies went and I felt so much more calm, it was amazing! I'd completely forgotten about this but I may have to pick some up to help, I'm such a worrier as well! This sounds really good and something I'd be open to try. I'm not a worrier per say, but when I push myself out of my comfort zone I tend to get nervous. I am only just starting to get some independence back in my life after being reliant on carers for so long so it's quite daunting at times. I'm glad this has helped you! P.S I watched your latest YT video the other day but I was on my phone so couldn't comment – well done you came across really well! My mum got me this, I haven't used it that often, but sometimes I use it if I'm anxious before bed, it's got quite a strong taste, a bit like vodka I think haha, but I think it's good, even if it's just a placebo. I think I'm going to try using it more. The pastilles sound like a good idea though especially cos Im usually anxious when Im out and about and the spray is at home. Do you know that there is a great Herbal doctor who can cure any deadly disease. Like herpes. Cancer, Hiv, syphilis, diebeties, madness, all kinds of deadly diseases known to man, low sperm count And also bring back your Lover, help you create job opportunities e.t.c. Well my main reason why i am writing this right now is to inform the whole world about the great deeds, Dr. LUKE did for me. i am VIVIAN JUDE I was diagnosed of this deadly disease in the year 2011 ever since then i was taking my medications, until i met the great spell caster, though i never believed in spell. I saw many testimonies on how a great spell caster cured their deadly diseases. I contacted him through his phone number. I called him, he asked me to send him my email, which i did. He gave me a form to fill, I filled it and send it back to him. He told me that his god's required some items in which he will use in casting a curing spell on me. I don't know where to find the items he required. He told me that the only alternative is for of to send him the money, then he can help me to purchase the items from the items sellers. I promised myself to do anything to get cured. I sent him the money. He bought the items and casted a curing spell on me. Two day later he asked me to go for check-up, when i did the check-up i was tested herpes Negative. If you passing through hardship and you need a way out, kindly contact him via his email on victorlukeherbalcenter@gmail.com for more information about his powerfull work. Am Juliet Dickson from Sweden I want to share a testimony on how this great man Dr Suku help me to heal my herpes virus is the solution to herpes cure,Since last 4 months I have being a Herpes patient.it was confirm I have be in several hospital but no one can cure it one day I was browsing through the Internet I saw a testimony on how Dr Suku from Africa healer and i saw so many testimony on blogger how is cure a lady called Grace and i asked her if she was cure by Dr Suku,what she said was yes that is heal and be free for herpes,she told me that there is a great spell caster that can cure my herpes Virus,I asked her if she had his email, she gave me his email, so I contact him and i told him I have Herpes virus,and I asked for solutions, he started the herbal remedy for my health, he sent me the medicine,and i start taking the medicine as prescribed by him and 2 week later i was cured from HERPES, Dr. Suku truly you are great healer, do you need his help also? Why don't you contact him through greatsukusolutiontemple@hotmail.com or his cell number +2348074839242,I’m the happiest girl in the world thank you Dr Suku he cure any type of disease HIV/AIDS,CANCER, ALS, Hepatitis B, HERPES, PVC/ through his via email;greatsukusolutiontemple@hotmail.com. Am Sarah Karrie from United State, I am so proud and happy to be out here sharing this remarkable, awesome and extraordinary review of your work Dr Bola. I just can't believe this now my ex lover is really back to me today October 14th,my love Karrie was knees presenting begging me to take him back and he was feeling regretful and sorry for leaving me and for causing me pains after the left me which was 3 year ago.on a faithful day i was browse looking for solution on line, i saw so many testimonial about Dr Bola on wix.com how he help so many people to restore relationship back,After reading all these, I decided to give it a try. I contacted him via email and explained my problem to him. In just 24 hours, my ex lover came back to me. We resolved our issues, and we are even happier than ever.Dr.Bola you are a gifted man and i will not stop publishing him because he is a wonderful man. If you have a problem and you are looking for a real and genuine spell caster,Try him anytime, he is the answer to your problems. you can contact him on drbolaspellcaster@hotmail.com his telephone number +2348059723809,i believed him and today i am glad to let you all know that this spell caster have the power to bring lovers back. because i am now happy with Karrie my love,Thanks for Dr.Dr Bola His email:drbolaspellcaster@gmail.com. AND LOT MORE JUST TEL HIM YOUR PROBLEM AND HE WILL HELP YOU. I'm here to testify about the great work Dr Marvel did for me. I have been suffering from (HERPES) disease for the past 5 years and had constant pain, especially in my knees. During the first year,I had faith in God that i would be healed someday.This disease started circulating all over my body and i have been taking treatment from my doctor, few weeks ago i came across a testimony of one lady on the internet testifying about a Man called Dr Marvel on how he cured her from Herpes Simplex Virus. And she also gave the email address of this man and advise anybody to contact him for help for any kind of sickness that he would be of help, so I emailed him telling him about my (HERPES Virus) he told me not to worry that i was going to be cured!! Well i never believed it,, well after all the procedures and remedy given to me by this man few weeks later i started experiencing changes all over me as Dr Marvel assured me that i will be cured,after some time i went to my doctor to confirmed if i have be finally healed behold it was TRUE, So friends my advise is if you have such sickness or any other at all you can contact Dr Marvel via email extremespellhome@hotmail.com . You can also call his telephone number +1 559 898 2962. Thanks once again Dr Marvel. Helen Robert. Good day to you all friends, my name is Kelly John from United State,I have been suffering from (HERPES) disease for the last four years and had constant pain, especially in my knees. During the first year,I had faith in God that i would be healed someday.This disease started circulate all over my body and i have been taking treatment from my doctor, few weeks ago i came on search on the internet if i could get any information concerning the prevention of this disease, on my search i saw a testimony of someone who has been healed from (Hepatitis B and Cancer) by this Man Dr OCUSODO and she also gave the email address of this man and advise me to contact him for any sickness that he would be of help, so i wrote to Dr OCUSODO telling him about my (HERPES Virus) he told me not to worry that i was going to be cured!! hmm i never believed it,, well after all the procedures and remedy given to me by this man, few weeks later i started experiencing changes all over me as Dr OCUSODO assured me that i have cured,after some time i went to my doctor to confirmed if i have be finally healed, behold it was TRUE, So friends my advise is if you have such sickness or any other at all you can email Dr OCUSODO on : (drocusodospellcaster@gmail.com) OR (drocusodospellcaster@yahoo.com) call him with +2348105578036 .. THESE ARE THE THINGS Dr OCUSODO CAN ALSO CURING OF GENITAL WARTS,GONORRHEA, HIV/AIDS , LOW SPERM COUNT, MENOPAUSE DISEASE, PREGNANCY PROBLEM, SHORT SIGHTEDNESS PROBLEM, STROKE, Bring back ex lover or wife/husband….sir i am indeed grateful for the help i will forever recommend you to my friends!! !